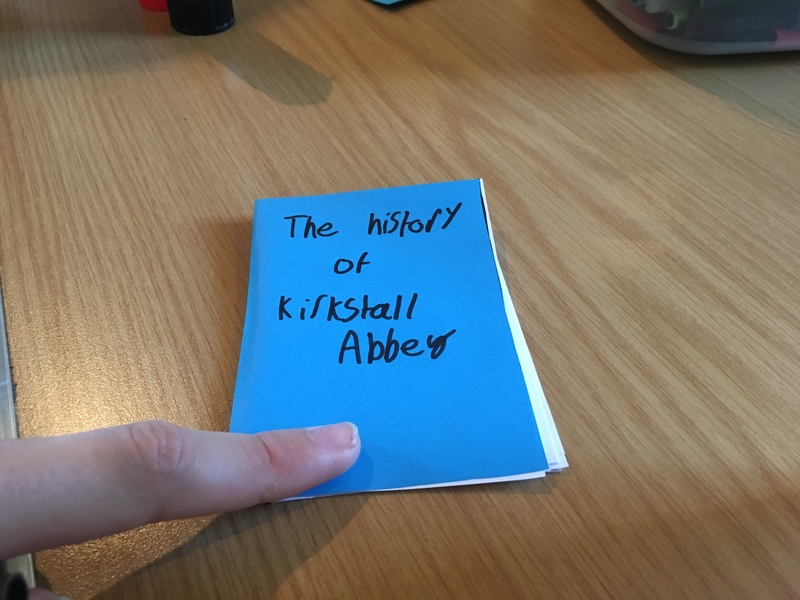 This weekend was the 3rd annual Kirkstall Arts Trail. 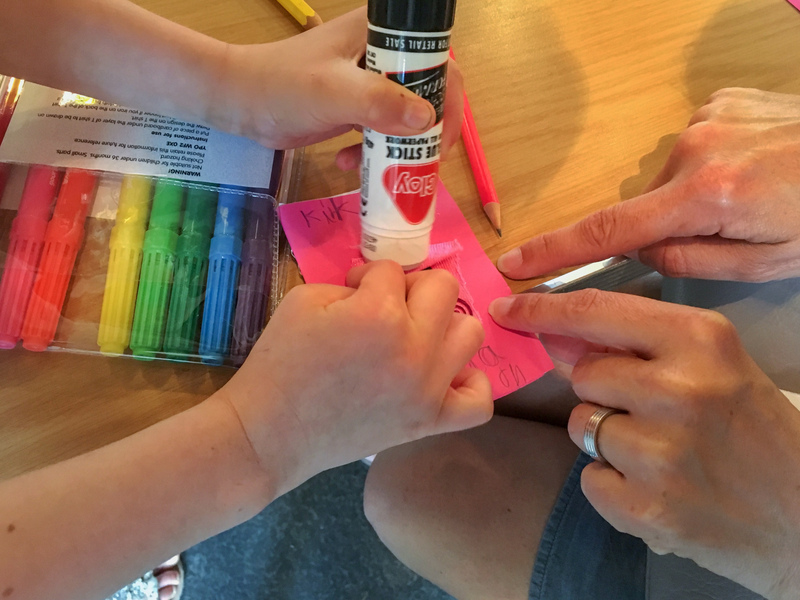 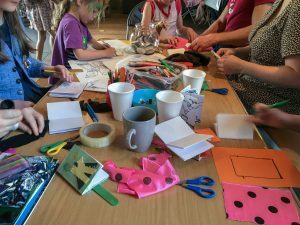 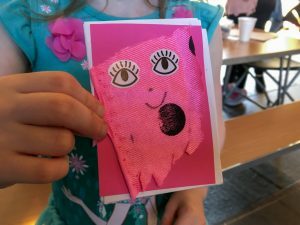 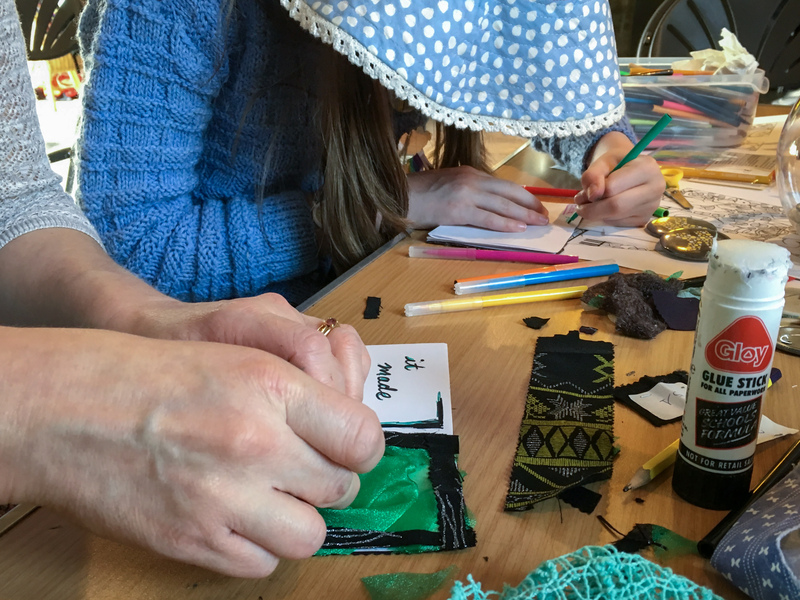 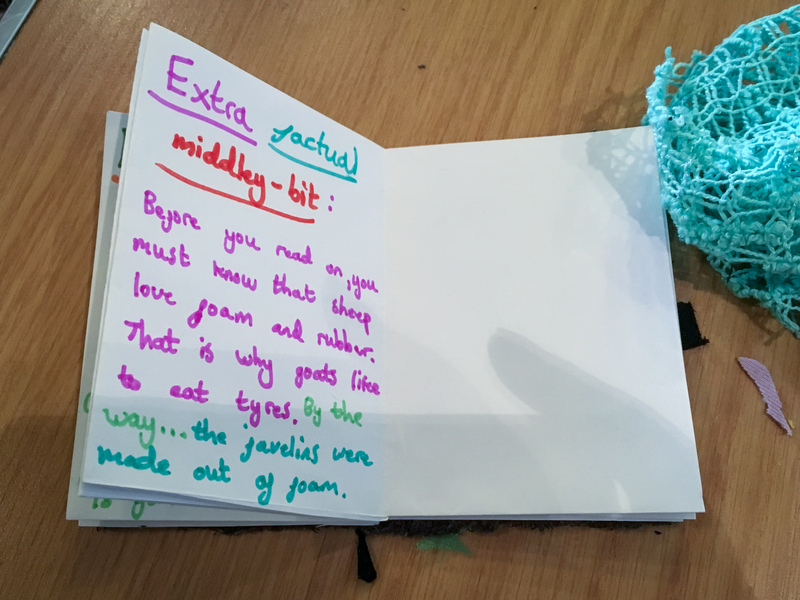 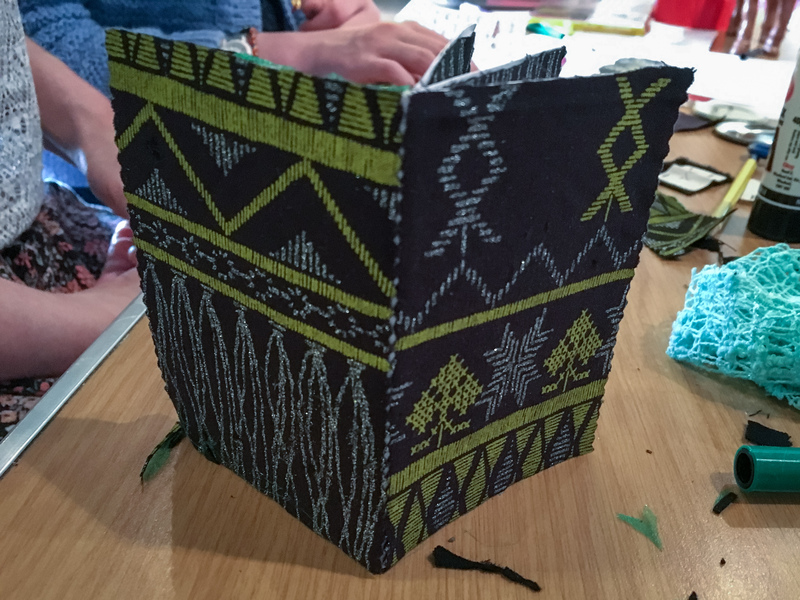 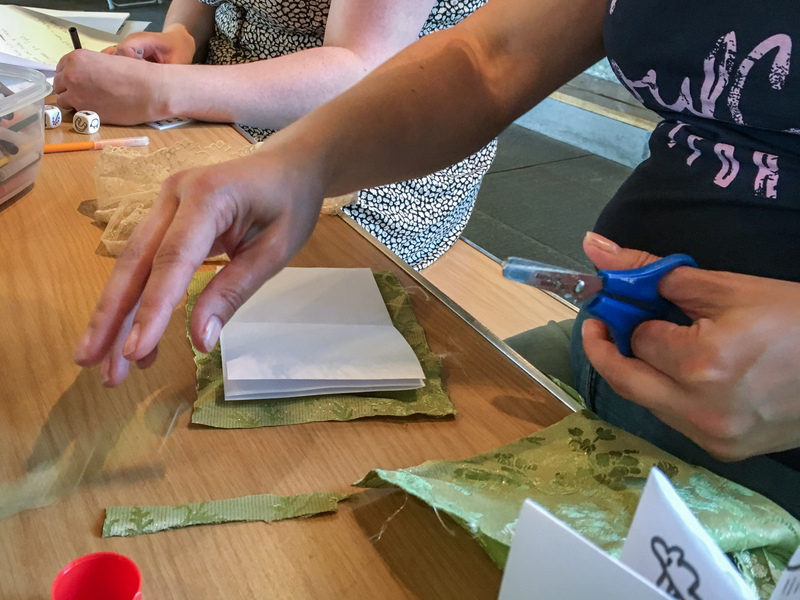 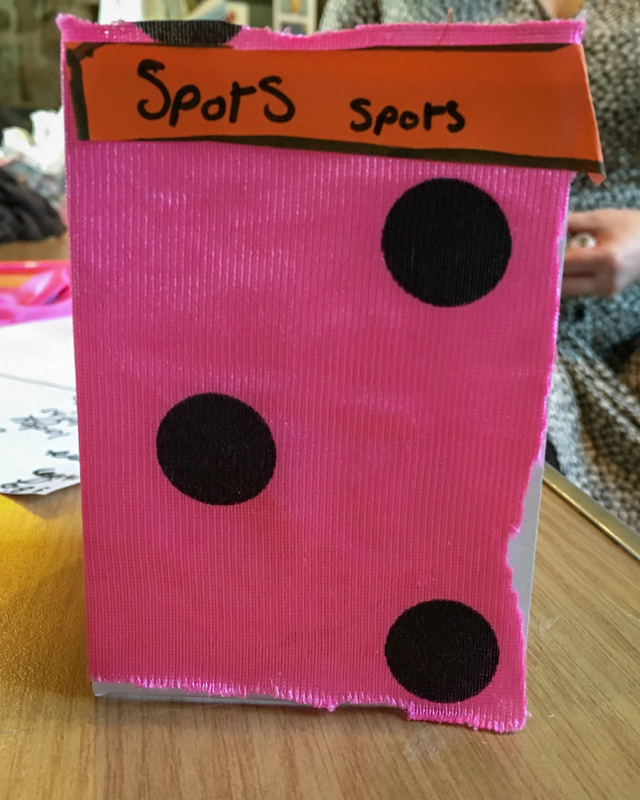 This year I opted to run a family workshop for Abbey House Museum (Leeds Museums). 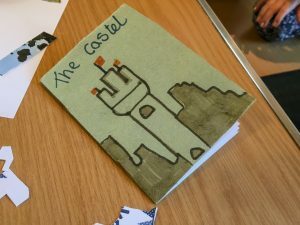 I’ve been running quite a few story based workshops, and thought a Kirkstall Stories inspired workshop would be great. 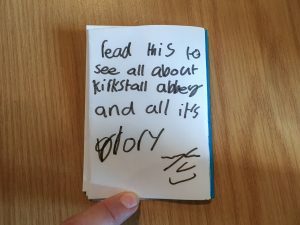 We were moved over to the Abbey’s Visitor Centre, which was a great idea, as we were based alongside the main KAT hub, and tea and biscuits on tap! 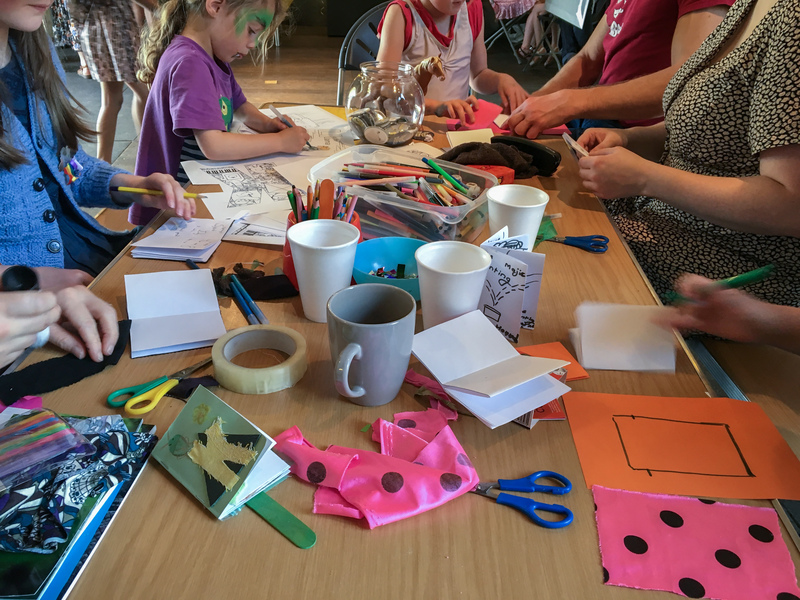 The day has been very warm, and we were visited by lots of people; sharing the space with a face painter was brilliant, even parents joined in, I haven’t seen many butterflies around recently, but saw plenty today. 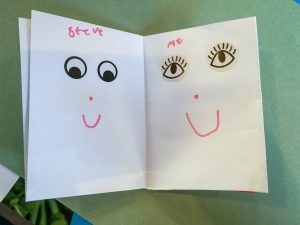 We worked well together, whilst waiting to have their faces painted, children could take part in the Stories workshop. 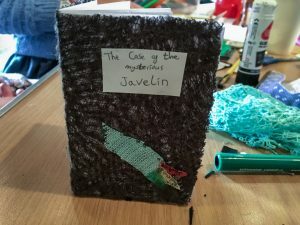 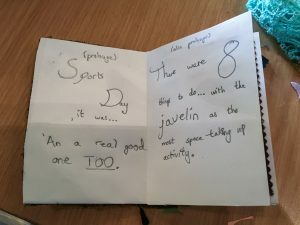 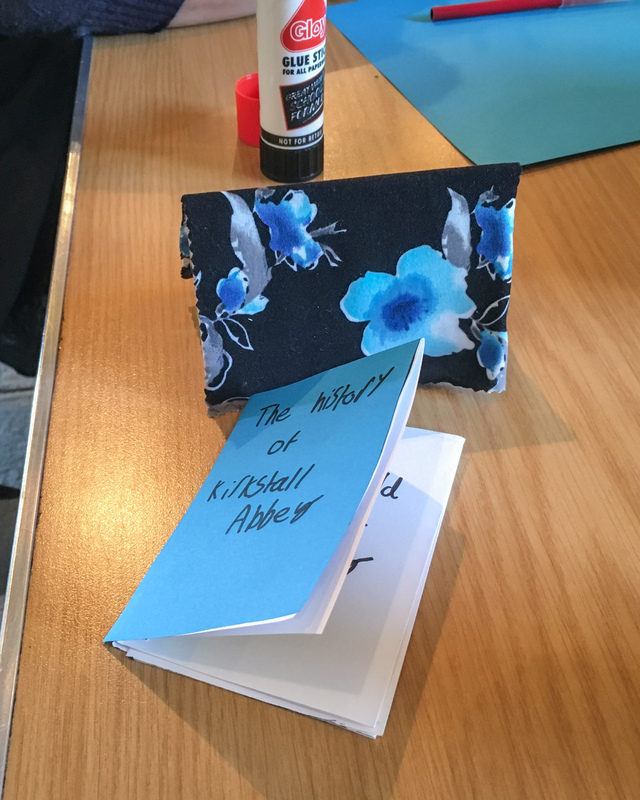 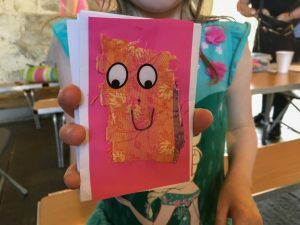 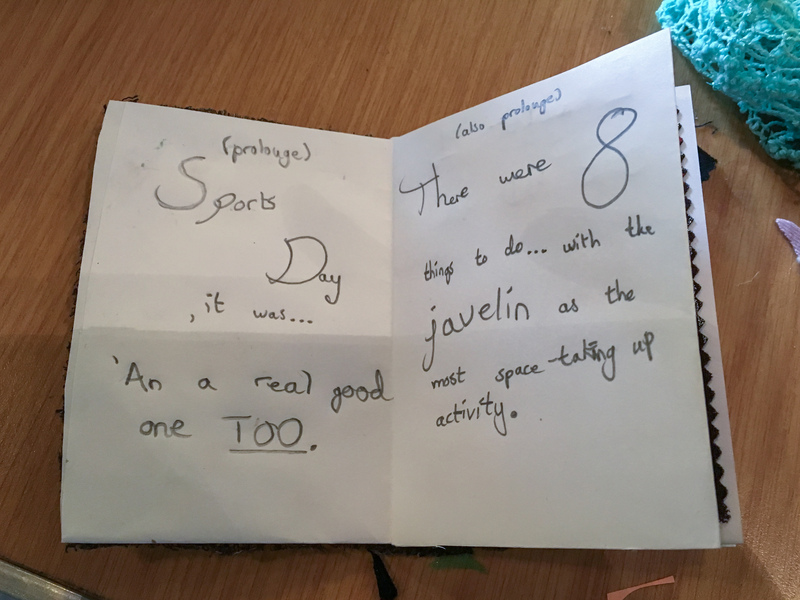 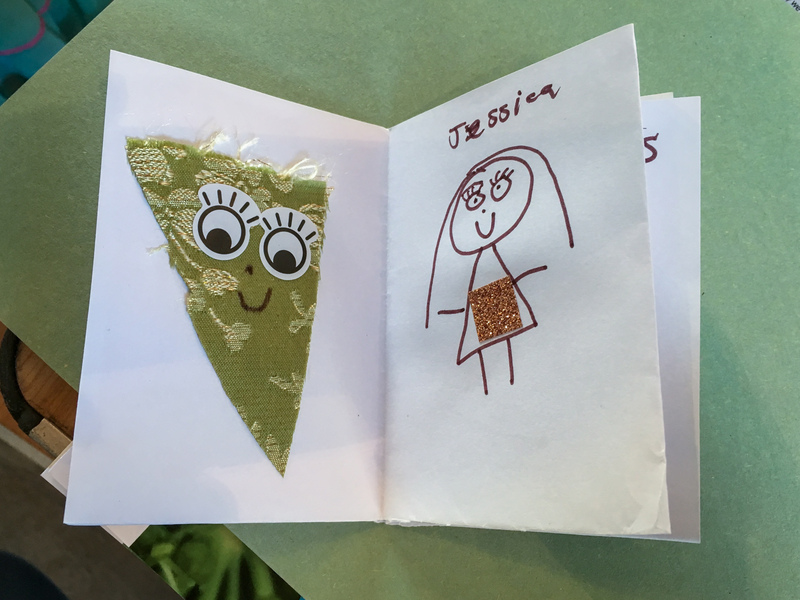 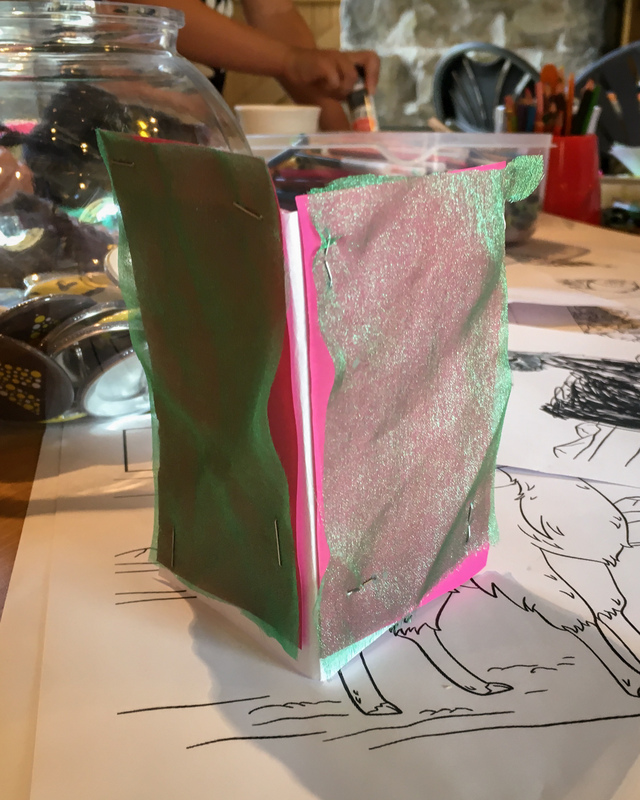 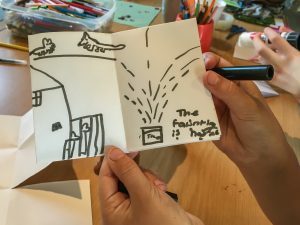 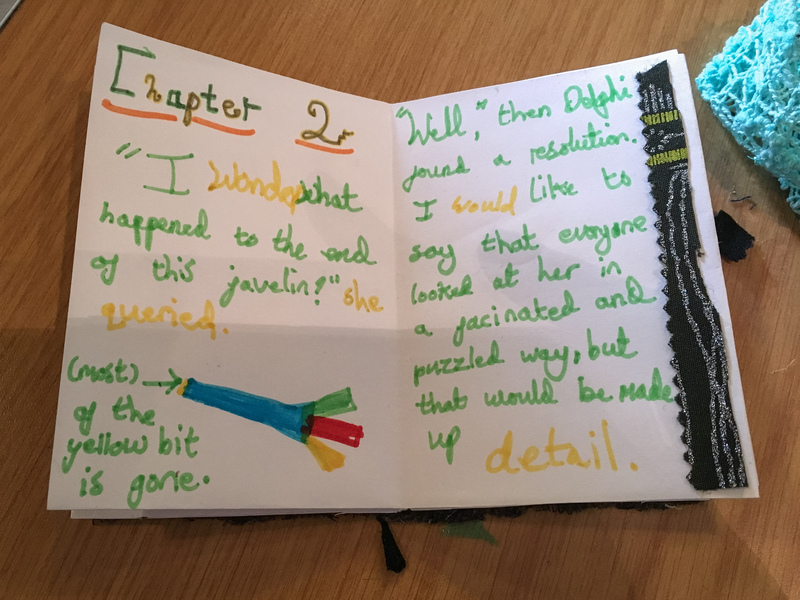 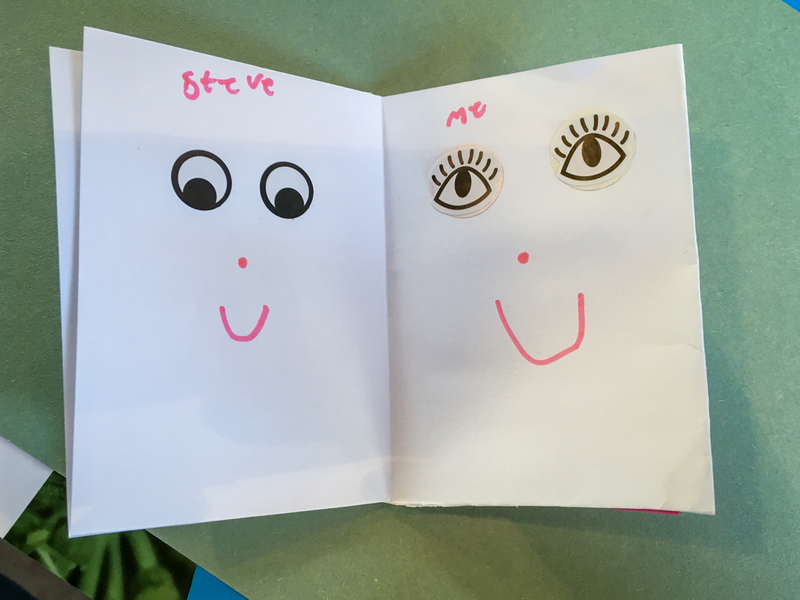 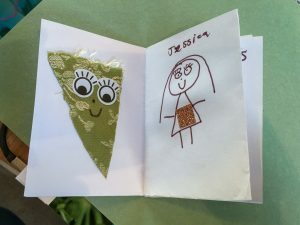 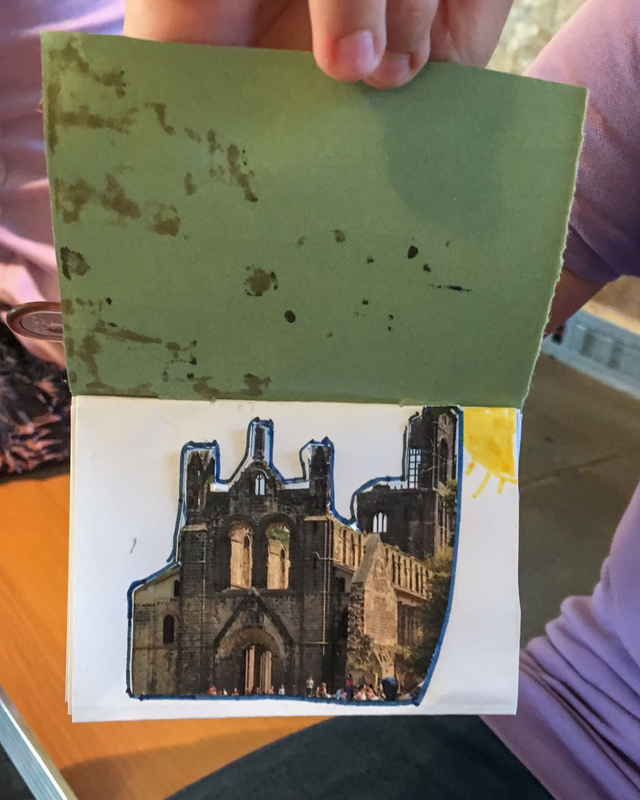 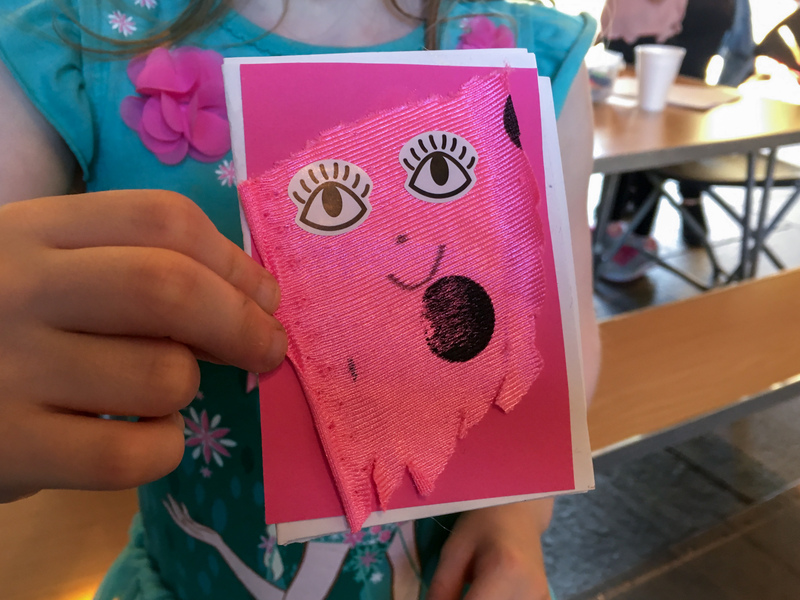 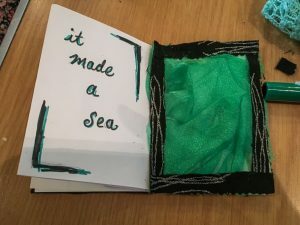 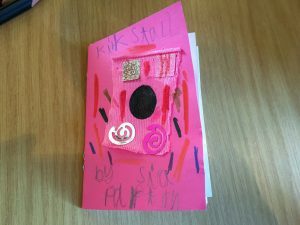 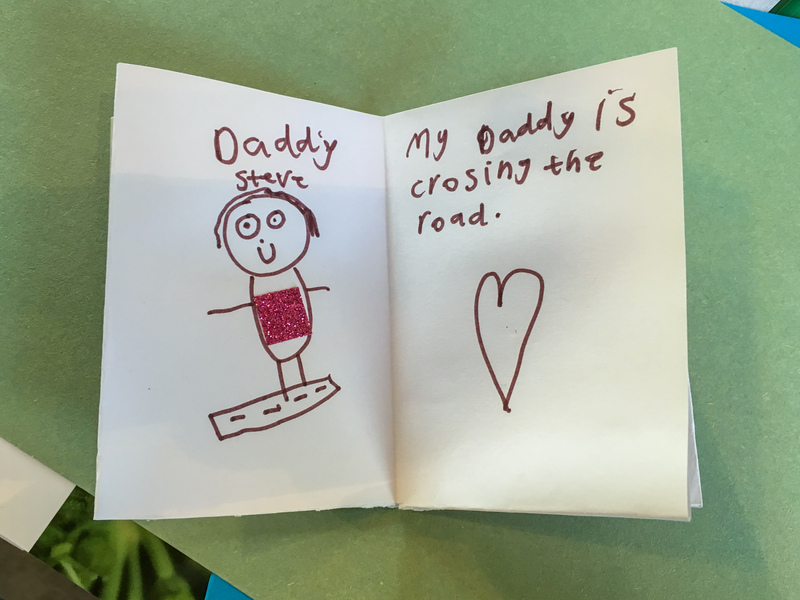 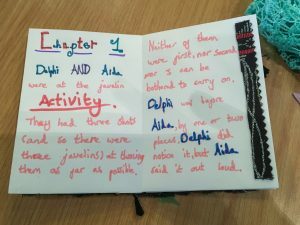 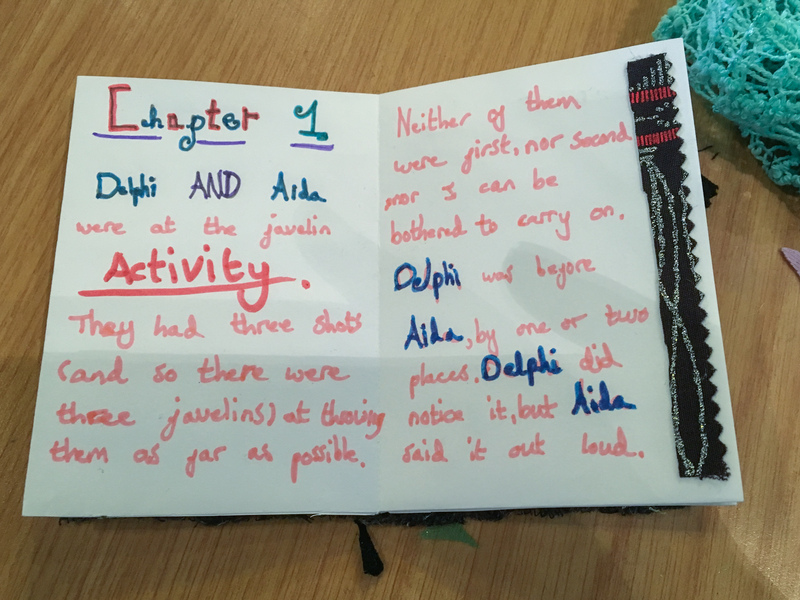 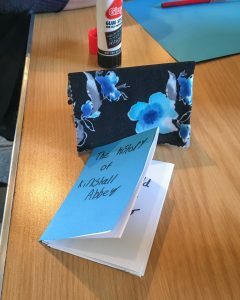 Some of the little storybooks the children created were inspired by their time in the Abbey, what they had seen on the trail, or they were just inspired by brilliant imaginations (they all had brilliant imaginations). 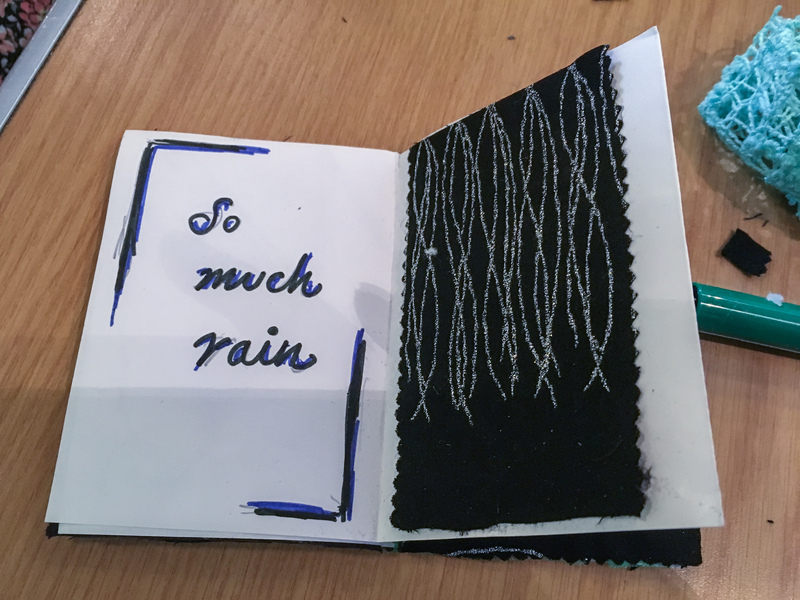 I am a great fan of using different materials to illustrate with, and we had a variety materials, coloured paper, glittery bits, sticky eyes, coloured pens and pencils, and plenty of different fabrics to use (kindly donated by my friend Kim Searle). I find if someone isn’t fond of drawing, then collage with materials is often a good choice. I also had my trusted story cubes, and photobooks of things mostly photographed in Kirkstall as inspiration. 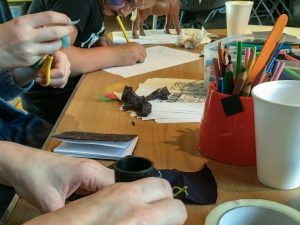 I really enjoyed the workshop, and sitting with families listening to what they had been up to on the trail, it’s wonderful that Leeds has so much to offer families that is free to participate in. 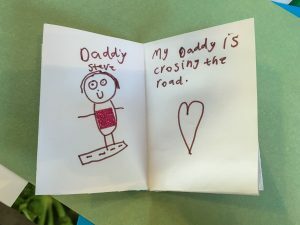 I didn’t see much of the trail sadly this year (due to illness), so I look forward to seeing all the photos of the weekend being posted online. 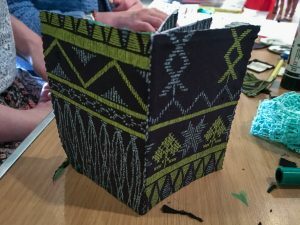 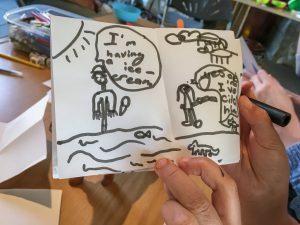 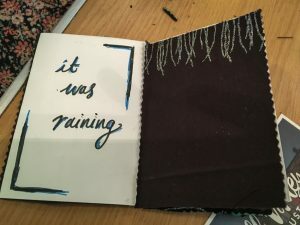 Please click on the images and scroll through them, they give insight into the book creation and tell more about the stories the participants were illustrating. 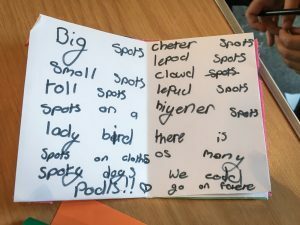 Big Spots, Smalls Spots, Tall Spots, Spots on a ladybird, spots on clothes, spotty dogs, poodles!! 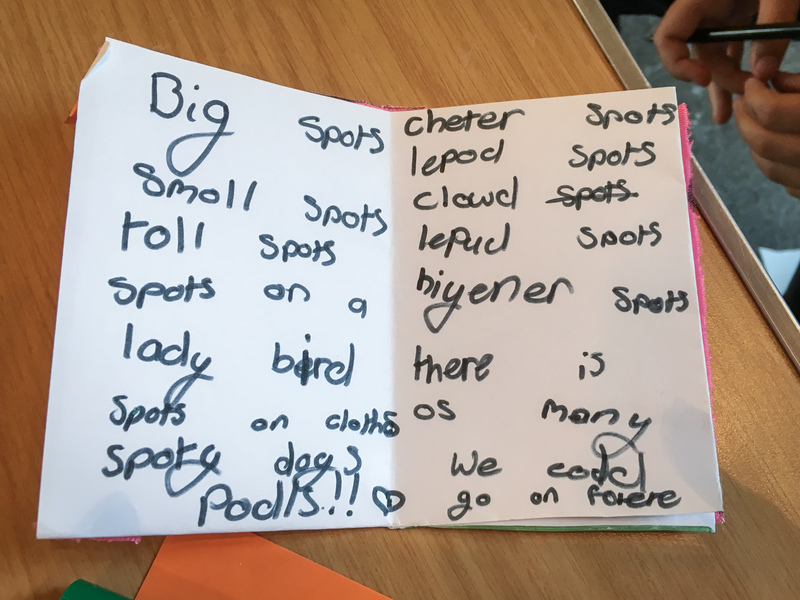 Cheater spots, leopard spots, cloud leopard spots, Hyena spots, there is so many we could go on forever! 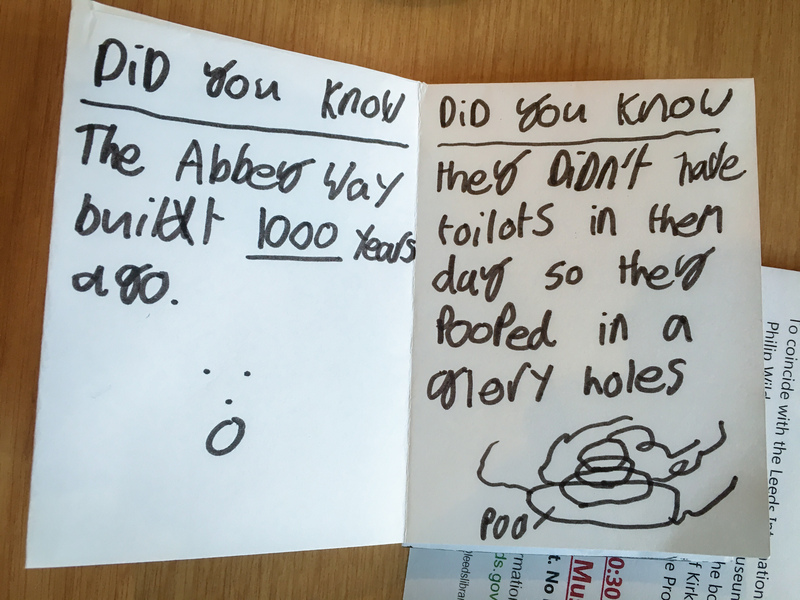 Did you know the Abbey was built 1000 years ago? 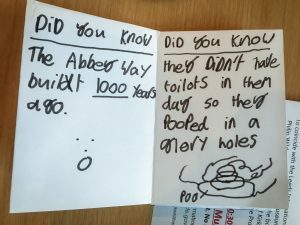 [Maybe under 900, but a long time ago all the same] Did you know they didn't have toilets in those days, so they pooped in glory holes. 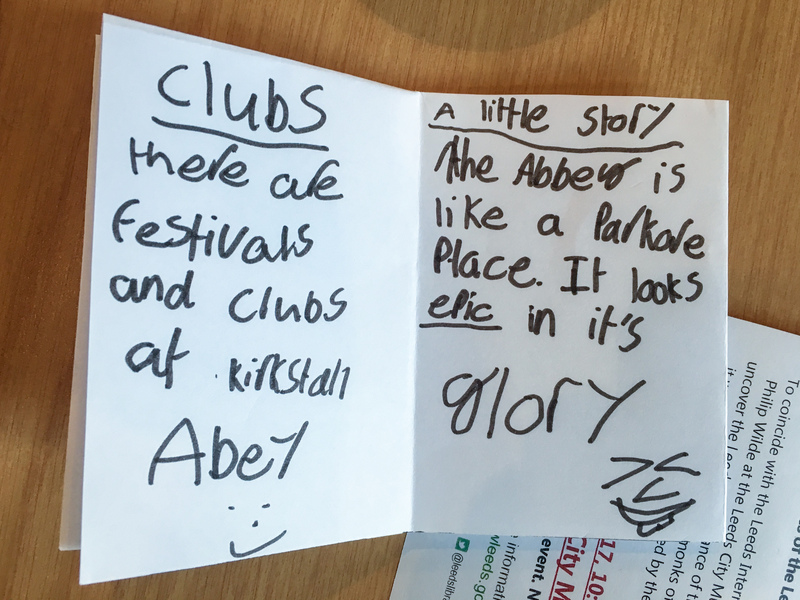 Clubs, there are festivals and clubs at Kirkstall Abbey. 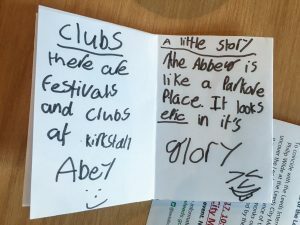 A little story, the Abbey is like a Parkore Place. 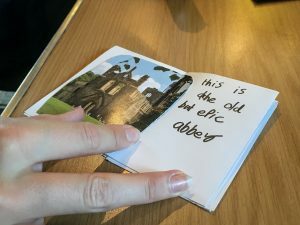 It looks epic in it's glory. 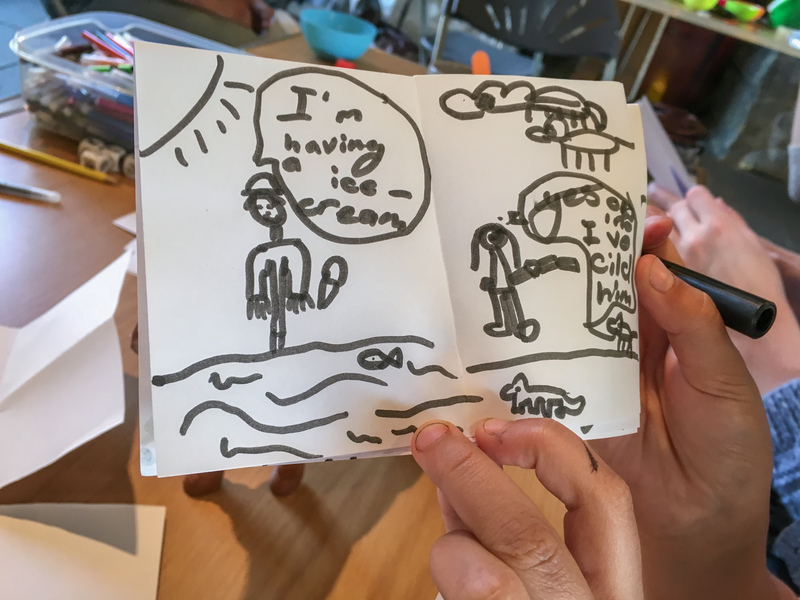 A random man says 'I am having an ice cream'. The girl is happy, 'yes'. 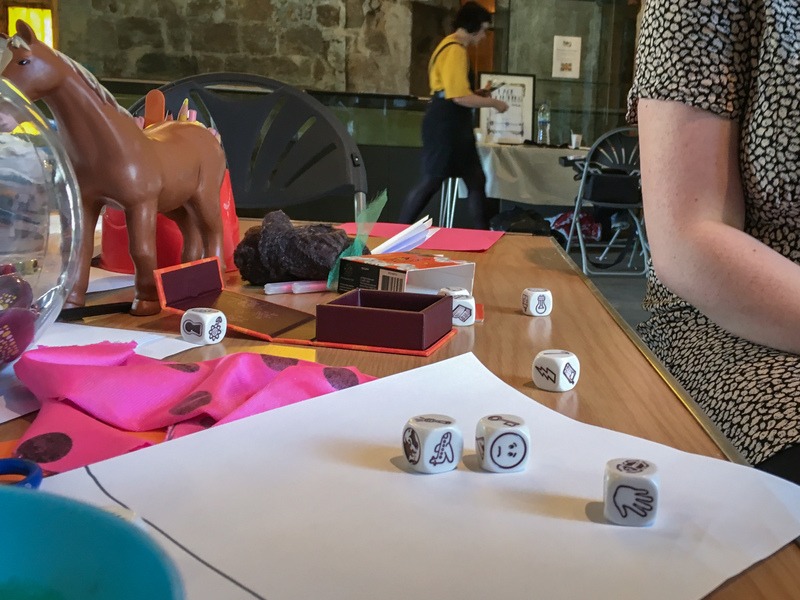 But then 'oh no I've killed him' somehow killing the horse. 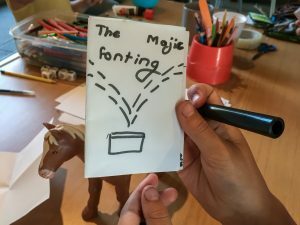 And the horse goes up to heaven dead. The horse then gets splashed by the water from the magic mountain, and comes back alive - as the magic fountain has powers that give life. 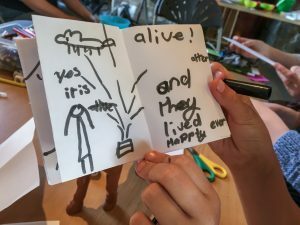 They all lived happily ever after. 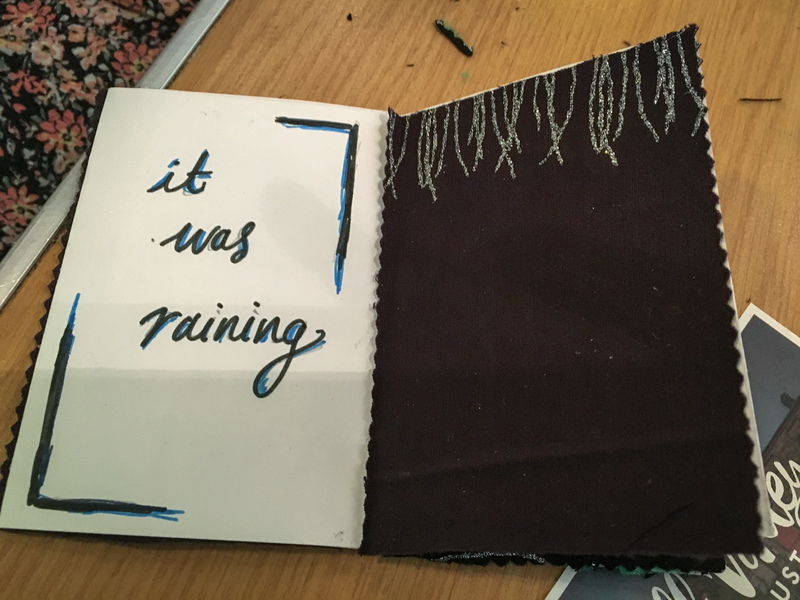 I was telling a story about a time I was in Trinidad and it rained so hard that the world in front turned white! 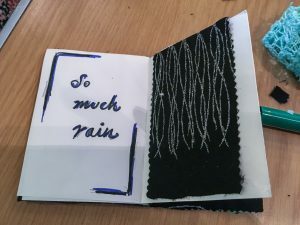 It inspired Pamela to make a story about rain. Pink is Sia's favourite colour. 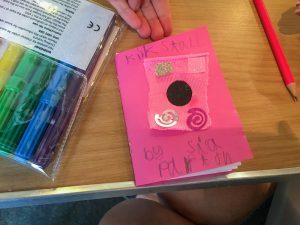 The young girl was waiting for her sister and mother to finish getting their faces painted, (she didn't want hers doing), so we sat and made stories from the cubes, and she took the book away to finish at home.